Today, 23 November 2012, is the 20th anniversary of the launch of the first smartphone. The IBM Simon was a handheld cellular phone and PDA that ended up selling some 50,000 units. This was impressive as, at the time, publicly available cellular networks were a rarity. In fact, at the London launch of the device, I remember wondering how many people would buy one given the high costs of both a subscription and the phone. In the USA, BellSouth Cellular initially offered the Simon for US$899 with a two-year service contract or US$1099 without a contract. 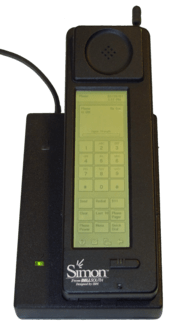 As well as a touch screen, the widget included an address book, calendar, appointment scheduler, calculator, world time clock, electronic note pad, handwritten annotations, and standard and predictive stylus input screen keyboards. Measuring 203mm by 63.5mm by 38mm, it had a massive 35mm by 115mm monochrome touch screen and weighed a stonking 510g, but was only on the market for about six months. The UK never saw it commercially available. So while it never really took off, this was largely down to timing: it was ahead of its time and it was soon overtaken by smaller, less well-featured devices that were more affordable. But when you contemplate which shiny shiny is your next object of desire, think about the Simon, and remember, Apple didn’t invent the smartphone: IBM did. I don’t need to tell you about the technology industry’s love affair with cloud computing – since as an individual you’re likely to be way ahead of most enterprises in your seamless use of cloud already. After all, you probably use email, you store files on Dropbox, and you sync with Google or iCloud. That makes you a cloud computing user. For a cloud provider however, extracting maximum value from expensive infrastructure is essential. And for that they need to be able to measure performance accurately – you can’t analyse what you can’t measure. And this is where Precise Software enters the picture. Precise’s software uses analytics to measure the performance of applications, in the shape of a new version of its flagship product, Precise 9.5, which it sells to large enterprises with their own datacentre and cloud facilities. The problem datacentre managers are having is tracking data as it moves from virtual machines across the network to storage and back again. The software is tailored to work with EMC and VMware‘s storage and hypervisor infrastructure, although a version that supports Microsoft’s Hyper-V and then Citrix Xen are planned in about six months. Precise is not alone in this area of the industry however, as the explosion of cloud computing is sucking in a growing number of companies keen to sell support products such as Precise. Additionally, the company’s focus on market leaders VMware and EMC may prove a barrier to many potential buyers, who are more likely to run heterogeneous environments. It’s an old story but it keeps on running. Companies employ PR companies to put themselves before the media. The main way they do that is through press releases. So would you be happy if your PR company put out a release announcing an initiative but which omitted not one but three key facts? Here it is, in all its glory, with only the PR company’s name stripped out to protect its blushes. Though, under enough pressure, I might publish that too…. The Common Assurance Metric (CAM) launched today is a global initiative that aims to produce objective quantifiable metrics, to assure Information Security maturity in cloud, third party service providers, as well as internally hosted systems. This collaborative initiative has received strong support from Public and Private sectors, industry associations, and global key industry stakeholders. There is currently an urgent need for customers of cloud computing and third party IT services to be able to make an objective comparison between providers on the basis of their security features. As ENISA’s work on cloud computing, has shown, security is the number one concern for many businesses and governments. Existing mechanisms to measure security are often subjective and in many cases are bespoke solutions. This makes quantifiable measurement of security profiles difficult, and imposes the need to apply a bespoke approach, impacting in time, and of course cost. The CAM aims to bridge the divide between what is available, and what is required. By using existing standards that are often industry specific, the CAM will provide a singular approach of benefit to all organisations regardless of geography or industry. The project team anticipate delivery of the framework in late 2010 followed by a process towards global adoption for organisations wishing to obtain an objective measurement of security provided by cloud providers, as well as the level of security for systems hosted internally. You’ll notice other issues (polite word) in there too. Who is ENISA, mentioned in the second para but never explained? Why is the first sentence only barely comprehensible — or even grammatical — on the first read-through? The second sentence in the second para doesn’t belong there, it should be at the top of that para. Since when does the phrase “impacting in time” qualify as English? And as for the last sentence/para, how many times did you have to read it to extract what the hapless writer was driving at?